Phase 1 is open ONLY to those exhibitors that were at the 2018 SAFRE show in Raleigh in August of 2018. During Phase 1, you can ONLY purchase the EXACT SAME SPACE that you had in 2018. If you are new Exhibitor, wish to acquire additional space or move to a new space, you must wait until Phase 2. To see which space you had in 2018, visit this map. During Phase 2 we will accept new Exhibitors; also during Phase 2, an Exhibitor that obtained a space in Phase 1 can purchase additional space as well as request to move to a new location. Please watch this short video to help you with placing your apparatus order. 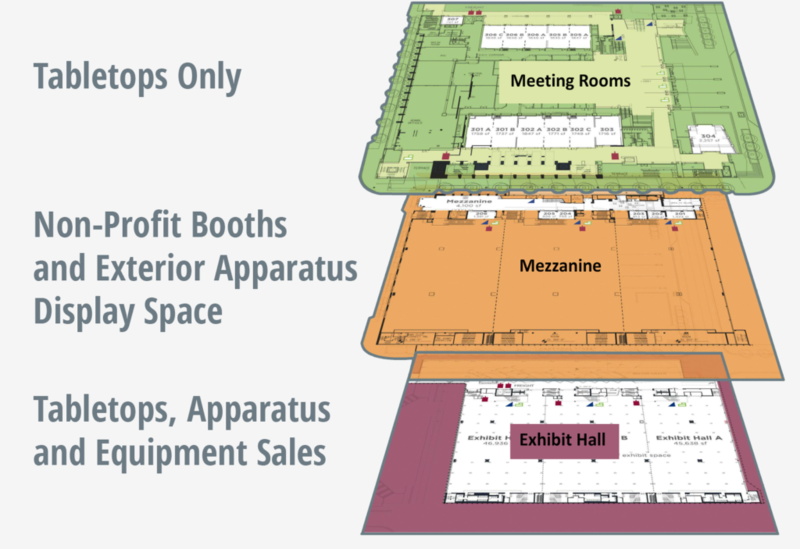 Apparatus spaces on the Exhibit Hall are sold in individual blocks of 20’x20′ space. To purchase space for ONE ENGINE – purchase TWO spaces (totaling 20’x40′). To purchase space for ONE AERIAL – purchase THREE spaces (totaling 20’x60′). You may purchase any combination of ENGINE and AERIAL spaces. If more than 60 days prior to Expo (June 20, 2019), fifteen percent (15%) of the total exhibit space rental fees shall be retained by the NCSFA. From 59 to 30 days prior to Expo (June 21 to July 24, 2019), fifty percent (50%) of the total exhibit space rental fees shall be retained by the NCSFA. If less than 30 days prior to Expo (July 25, 2019), the full amount of the rental fee shall be retained by the NCSFA. Ensure that you choose the correct level for your type of desired space.